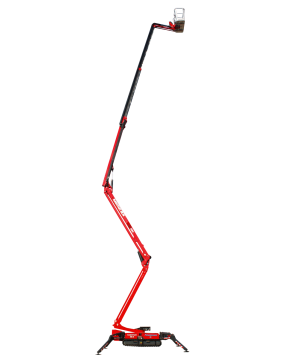 Be one of the first to add the new Hinowa 13.70 Performance IIIs tracked spider boom to your fleet. Reserve TODAY! Hinowa’s versatile tracked booms and spider lifts provide work at height solutions that are beyond the ability of conventional booms and scissors. The Performance IIIs range provides impressive reach and platform load capabilities, with the added option of emissions-free Lithium power. The Hinowa mini-dumpers and tracked forklifts are the contractor’s machines of choice for handling goods over challenging terrain. With extremely low ground pressure and very compact dimensions, enabling them to easily pass through garden gateways, doorways and down narrow passages. 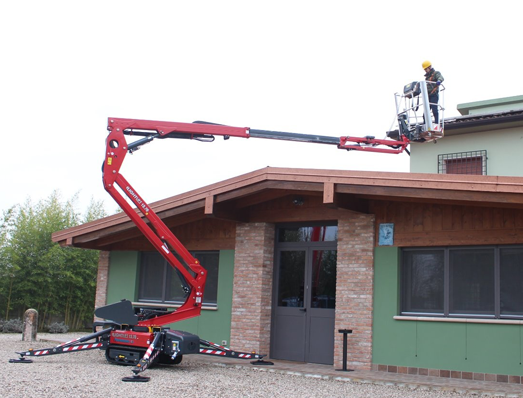 Hinowa crawler-mounted booms are ideal for a huge range of internal and external applications; from commercial and residential property maintenance, to arb & tree work and painting & decorating. Hinowa’s lightweight booms are easy to transport from site to site on a trailer towed by a saloon car, 4x4 or light commercial vehicle. The tracks help the units to comfortably deal with almost any type of ground conditions, including mud, snow and sand. Access Platform Sales are proud to be the authorised UK distributor for Hinowa equipment and replacements parts with a comprehensive after-sales service offering over-the-phone technical advice and nationwide mobile service support. Founded in Italy in 1987, Hinowa S.p.A. has built a reputation for designing innovative and class-leading tracks mounted compact machinery. With working heights from 13m to 26m and power options including lithium batteries, mains electric and petrol or diesel engines, Hinowa tracked booms can add value to almost any rental fleet. 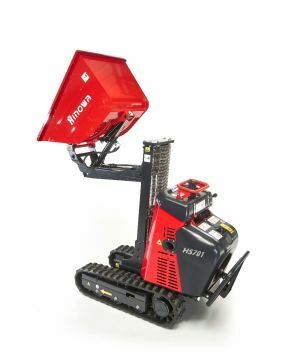 This includes Hinowa tracked access platforms, Hinowa spider lifts, Hinowa mini-dumpers, and Hinowa tracked forklifts. Hinowa’s innovative ‘Lightlift’ range features ‘Performance IIIs’ technology, which make transporting and setting up fast and efficient. With working heights of up to 25.7m, and load capacities of up to 230kg, the Lightlift range has superb working capabilities, and offers petrol, diesel, and lithium battery power options to suit the needs of the user. The tracks distribute their weight to ensure low ground pressure, and fold-down outriggers stabilise the machines, meaning that they can still reach significant heights. This combination makes Hinowa boom lifts very popular for construction or maintenance applications where soft ground is an issue; and for internal work on expensive or fragile floors in shopping centres, museums and other public buildings. 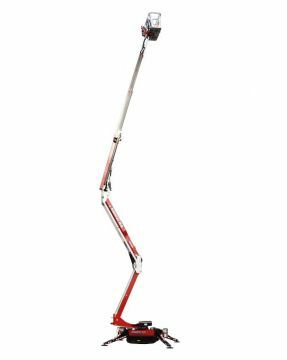 The extensive product range includes the Hinowa Lightlift 13.70, Hinowa Goldlift 14.70, Hinowa Lightlift 15.70, Hinowa Lightlift 17.75, Hinowa Goldlift 17.80, Hinowa Lightlift 19.65, Hinowa Lightlift 20.10, Hinowa Lightlift 23.12, and Hinowa Lightlift 26.14. Hinowa’s mini-dumpers and tracked forklifts are stand-on machines with low ground pressure, ensuring smooth operation on soft or uneven terrain. The compact but robust mini-dumpers are available in a range of configurations, including self-loading buckets and hi-tip masts for loading skips and trucks. 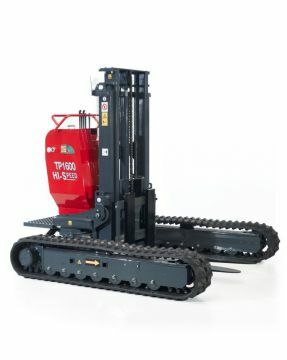 The tracked forklift range, with loading capabilities of up to 2000kg, make light work of heavy lifting, and are designed to transport goods over soft, boggy and uneven ground. Book a Hinowa approved service & maintenance plan, where only Genuine Hinowa parts are used by factory-trained engineers. We won’t keep you waiting! We hold hundreds genuine Hinowa parts in stock ready for same day despatch. Nationally recognised training courses including IPAF operator, available at your site or at one of our training centres local to you.